We took to Lyric Square on 1 April to alert H&F residents (and various shoppers) to the consequences of a 3rd runway on our borough. Considering that it was the first day of Spring/Easter schools holiday and footfall was lighter than usual, we had many conversations with people. 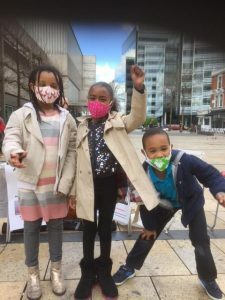 Those who stopped to speak were concerned about the pollution effects on residents, especially the young, as well as road and tube congestion. A few were glad of a chance to fly to their holidays from a nearby airport and we reassured them we are not seeking Heathrow’s reduction in size, only opposing further expansion. Some thought a 3rd runway was an entirely done deal – very worrying as this is what Heathrow’s propaganda is aiming for.